Just over 21 knots is not a bad speed for Queen Elizabeth. 25 mph. That should get us to Piraeus by 6.30am on Thursday morning. The Captain wants to get us into the berth before the ferry rush hour starts. Mrs Smith won’t be up by then, but I love to watch the ship docking. It’s been a glorious day today and the majority of guests have been out on deck. 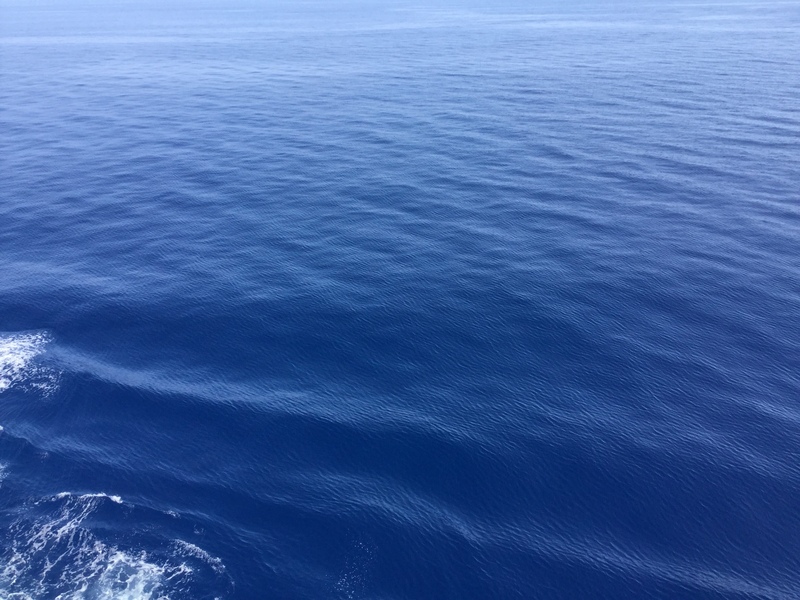 The sea is a beautiful blue and there is no other shipping to be seen in any direction. Tomorrow Athens – if we can find suitable transport. So far no success. Then three more ports in a row. Santorini – Crete – Olympia. 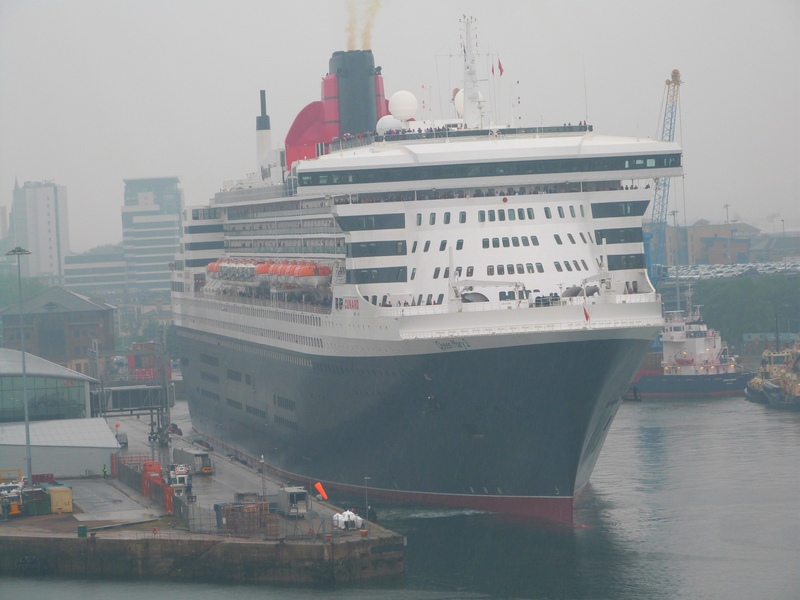 Queen Elizabeth picked up her pilot soon after 7.15am on Monday 28 May. The sky was grey over the island as we approached Palma. 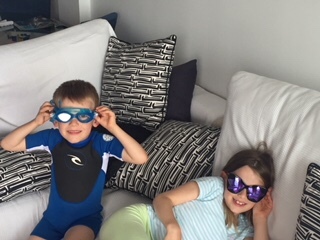 Sister in law Sarah had predicted horrible (uppercase) weather in her email to me the day before and “don’t forget your swimming things” which seemed odd! We were soon on our way in an adapted taxi, which deposited Kim, Jane and me at the Apartamentos de Mer where Sarah and David have owned their holiday apartment for 30 years. Until 3 or 4 years ago Jane and I had a few days or a week there most years, with Sarah and David, but accessibility became a problem. But it was good to be back. We had a great day. The weather improved. The sun came out and Katie and Sam’s children swam in the (rather chilly) pool. This is while they were plucking up courage. David Holt has never missed his daily coffee at Cappuccinos and we were all invited to join him. 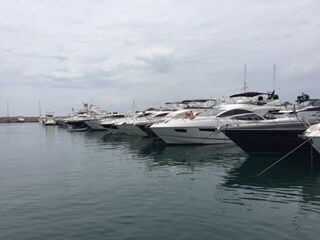 Then after a stroll round the marina, hoping to find a yacht with an owner aboard who might offer us a drink (no such luck – the Jacksons were back in the UK) we returned to the apartment. Sam is not only a computer wizard, but also a brilliant cook and we had a magnificent lunch on the balcony overlooking the massive yachts, most of which never appear to go to sea. 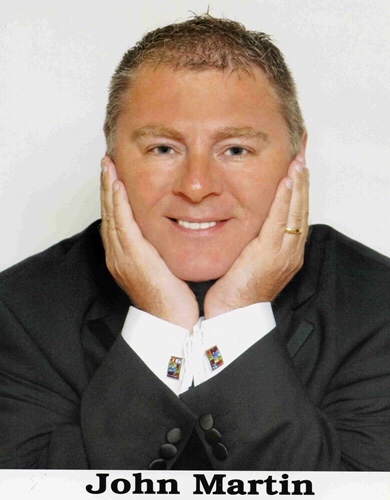 I must mention the comedian who entertained us after dinner. John Martin. He was a class act and had the whole theatre in stitches for 45 minutes. Louise in Tooting reported a strange presentation of my blog when she received an email notification of a new piece. Very large images and very small print. You may have received something similar. If you click on the blog itself there appears to be no problem. Luckily I am seeing Sam, the blog guru, in Majorca tomorrow. I am sure he will sort it out. Today, Sunday has been beautiful. Small ripples on the Mediterranean Sea that we entered at about 7.00am and clear blue skies. There will be a number of red bodies around the ship tonight. We were about 55 miles away from Malaga as we passed this morning and we then turned towards Majorca. 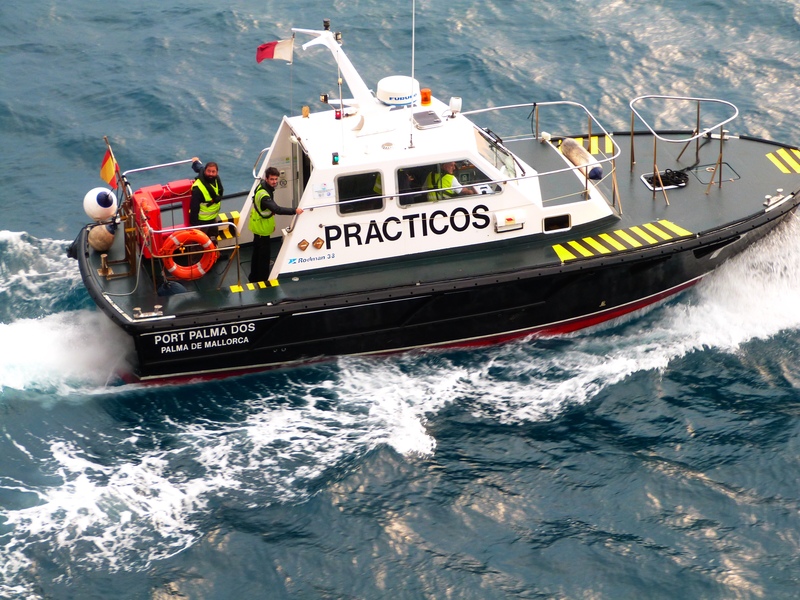 The Captain says that we will pick up our pilot at 7.00am tomorrow and should be on the berth in Palma at 8.00am. Those wanting to watch as Queen Elizabeth passes Portals Nous will need to be up early! Plenty to report. The weather was not very special yesterday as we sailed south, but the Bay of Biscay was calm. The sun is out now as we pass Lisbon, then it’s Cap St Vincent and a left turn into the Med. 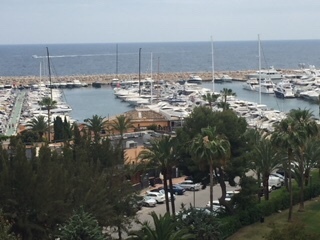 At midday the Captain said that we had covered 830 nautical miles since Southampton, which means that we are half way to our first destination – Palma de Mallorca. Or Majorca to you and me. Jane’s sister Sarah and her husband David have an apartment there in Portals Nous. They will be there on Monday as will Katie and Sam (whose wedding we went to in Italy last September after we had absconded from this ship for 4 days) and their children Zoey and Hayden. Lunch on the balcony and a glass or two of Rioja hopefully. 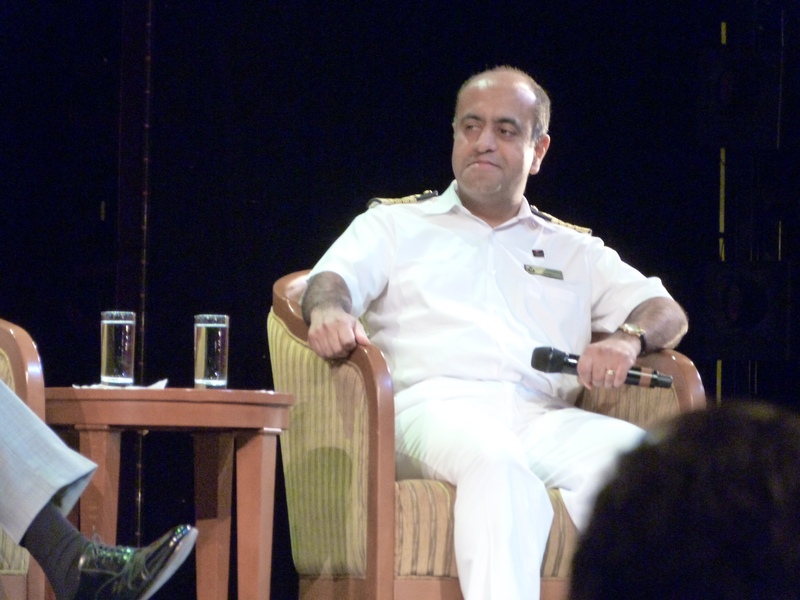 One of the speakers on the ship is a retired sub mariner, Commander Jeff Tall, a Captain of numerous submarines and an excellent speaker. Today’s lecture was on the Battle of the Atlantic. Illustrated with old film and plans and maps, it kept me awake throughout and taught me a great deal. My father, who spent most of WWII on the North Atlantic, on the old Queens, rarely talked about the war. After a number of days of preparation we made the easy journey to the Mayflower Terminal, Southampton. Gary the taxi driver, me and a multitude of cases in Gary’s 8 seater and Jane and Kim in the adapted Vauxhall driven, as usual by Ian Gordon. On arrival at the terminal, the luggage disappeared and within minutes we were checking in. Mugshots taken, Ships ID cards issued and we were first into security. Belt removed, trousers ankled, metal knee detected and we were on board. Less the 30 minutes from taxi to cabin. Miraculous. Well done Cunard. And a bonus for us. Captain Aseem Hashmi is the Master. He apparently joined the ship in Kiel. As we left Southampton, the rain started to fall heavily and visibility declined. 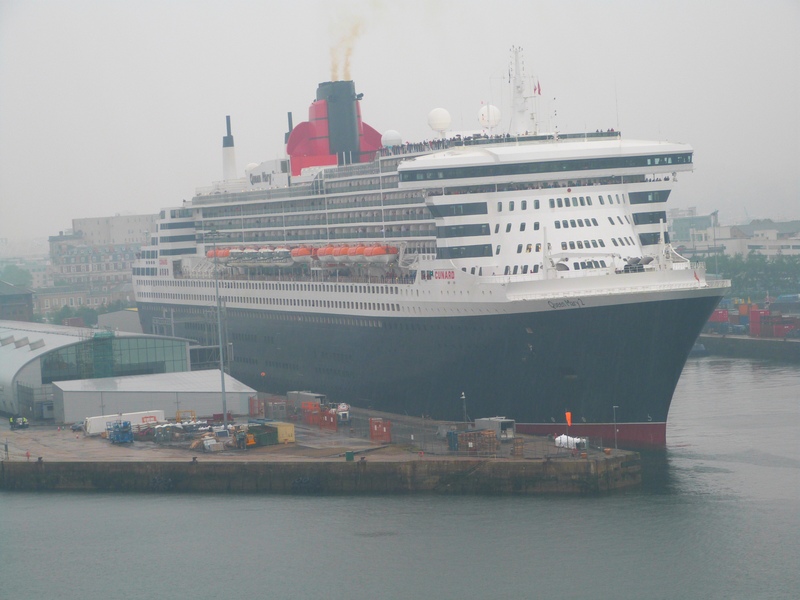 It was a shame because after we left the berth and set off down Southampton Water, we passed Queen Mary 2, also in port for the day. My photos are not as good as they might have been. I am the son of Captain George Smith, who was one of only three Captains who were Masters of both the original Queen Elizabeth and the QE2. He was the second ever Captain of QE2. 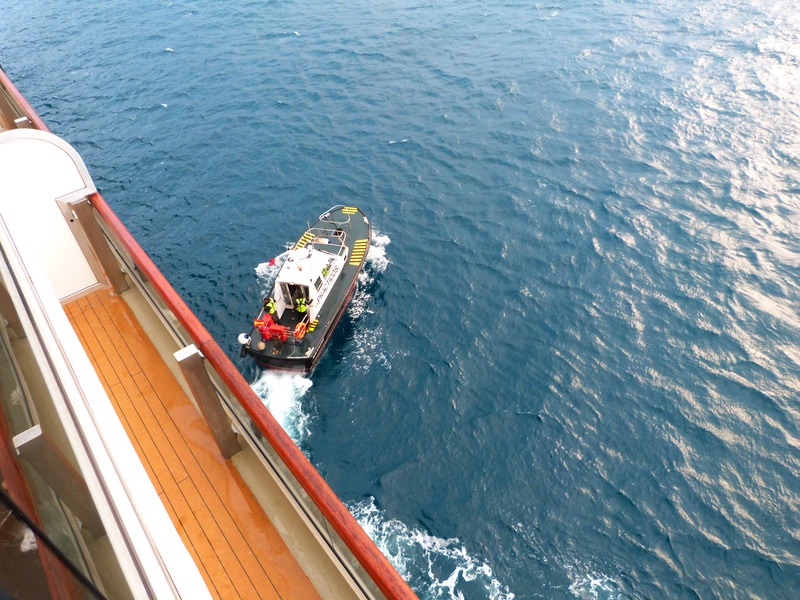 When our children finished at University, my wife Jane and I booked ourselves onto the Maiden voyage of QM2 and since then we have travelled the World on Cunard (and other) ships. We loved Regent and Princess and, of course, Seabourn, but we always end up with Cunard. In 2014 we spent 5 months on Queen Victoria. Copyright © 2019 smithyscruiseblog.com All rights reserved.